The TELECINE is a process allowing to transfer a film to a video media. When this transfer is made to a digital media like a DVD or MiniDV, it's called digitization. The telecine is some kind of film projector whose pictures are directly fed into a television camera connected to a video recorder. This process guarantees an optimum quality transfer and avoids loss of brillance and/or unwanted parasite lighting. Amateur film format developped and marketed by KODAK in 1932 to compete against the PATHE 9,5mm format. It was actually a 16mm film strip with twice as much sprockets holes as conventional 16mm film and which was first only exposed on the half of its width. At the end of the film roll, the spools in the camera were swapped and a second exposure on the other half of the film took place. After processing, the film was cut in half and the two piece of film were reunited. The 8mm film was widely used by the general public. It was replaced by the Super 8 after 1965. Amateur film format marketed in 1965 offering a wider picture and improved quality over conventional 8mm format. The exposed picture size on the film was 50% bigger by using smaller sprockets. 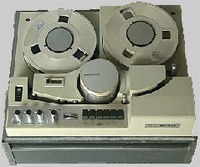 First silent, it evolved into a sound film system in 1973 when a tiny magnetic strip was added on the side of the film. The very first amateur film format marketed in December 1922 by PATHE. Its main characteristic is a single central sprocket and its width comes from the 35mm standard film stock used for its manufacturing and cut longitudinally in 3 strips. This format was very successfull from the beginning since PATHE sold or rented many of their productions in this format in film cassettes of 15 or 30 m lengths. The catalogue included newsreels, documentaries, comedies and event 'long run' features. In 1923, a small and cheap camera was marketed, which achieved popularity of this format in Europe. Ultimately, in 1938, a sound version of the 9,5 mm was marketed with the 'PatheVox' sound projector. Hi-end amateur or professional film format, the 16 mm is still widely in use today, at least under its Super16 incarnation. The first version of this format was silent, beared two rows of sprockets and was marketed in 1923 by KODAK. A sound version with an optical or magnetic sound track replacing one of the sprockets row became a professional standard in 1932.